About a month ago our Doe, Gabbie, had 12 baby bunnies! I was so sad when I found all 12 lying dead outside of the mother's cage! We had no nest box ready for Gabbie to successfully birth her babies. So I guess the Mother rabbit pushed all 12 babies out of the wire cage? My daughter had (unknowing to me) let the Doe and Buck "play" together while she cleaned their cages one day. I didn't let my daughter or any of our kids know that Gabbie ever had 12 babies. Now that I have read what to do to have a nest box ready, we are ready for the birth of the bunnies this time! Will the mother rabbit know what to do with the nest box this time? As I looked back on the days prior to birth last time, Gabbie had a LOT of fur she pulled out 1 or 2 days before the bunnies were born. And my daughter had told me the day before, that Gabbie was very mean and nearly bit her when she went to feed her! Day 28 is on April 13th and day 31 on April 16. If anyone can give some tips on what we can do to have some live baby bunnies this time, please post some comments. Somehow Gabbie didn't end up pregnant after she was together with the buck in the month of March. But we had them together on the 20th of April, and waited for day 27 to put the nest box in the cage. But I thought I'd leave her cage open to the fenced in area for the doe to have one last night of freedom! The next morning (day 28) Gabbie was laying in her open cage and she acted different when I fed her. I closed the cage and she began acting a little restless and strange. I looked around in the fenced in area and found 2 places with lots of piles of fur. Then a closer look at a burrow filled with fur showed the fur wiggling! I quickly got the nest box and began counting and transferring the babies to the box. I counted out 6 black colored and 3 white and black colored kits. I found just one was dead, but the remaining 8 had round tummies and warm and lively! I returned the nest box full of babies to the new mommy and she sniffed them and began pulling out more of her fur to add to the box. She is a very good mother! I feel like chuckling at your story, but don't want to make you feel bad...! The good news is that Gabbie was showing very strong mothering instincts. She did her best to take care of her babies, but without a box, the kits simply crawled away and fell through the cage wire. (Does have no instinct for corralling and bringing back stray kits. They just don't do it.) It happens to every breeder, hopefully just once, heheh! 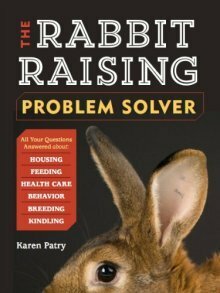 Look over the Raising-Rabbits website at the pages about breeding rabbits and preparing the nest box. You've already got the timing down - I think everything's going to turn out great the next time around. Good luck, and let us know how it goes, okay? !